The mosquito frame screen sliding system protects interiors from insects and is applied in large, glazed balconies, terraces and conservatories. The mosquito screen leaf slides between upper and lower rail. The lower section features a contact roller with a mechanism to allow the smooth adjustment of the inclination angle of each of the leafs. Additional reinforcement, installed through snap joint allows for leaf frames of larger dimensions. Frame and rail profiles are made of a robust extruded aluminium section with a modern shape, varnished with a coating of increased resistance to abrasion and influence of atmospheric conditions. The shape of the main mosquito screen profile eliminates the need for using additional hand rails. 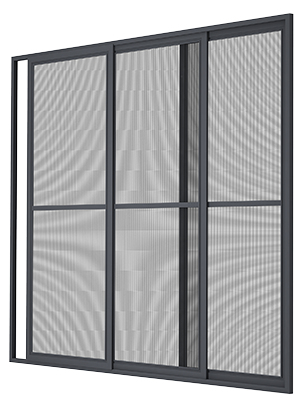 The frame and leaf of the mosquito screen are installed with the use of inner corners. The mosquito screen may be installed in a three-row set-up.